The exponentially growing number of connected devices, huge data volume especially video content, and rapidly increasing internet traffic are pushing service providers toward reducing the network complexities with lower latency time as well as lower capital & operating expenditure. Edge servers are readily deployed to improve customer experiences and reduce network complexities across different verticals including BFSI, government, and others. BFSI, government, commercial offices, IT/ITeS, telecommunications are the major end users of edge servers. BFSI bagged highest revenue share in 2017, however, government vertical is projected to exhibit highest growth rate during the forecast period; the high growth is attributed to smart city project and digital India initiative by the government of India. 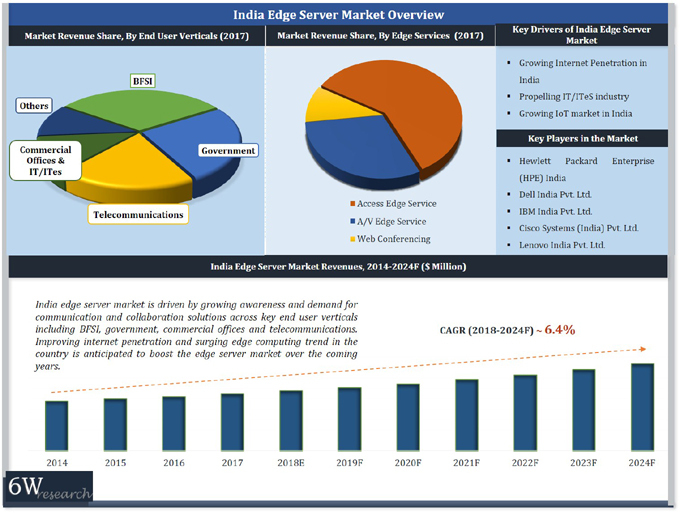 The report thoroughly covers edge server market by types, topologies, edge service types, end users, and regions. The report provides an unbiased and detailed analysis of the on-going trends, opportunities/ high growth areas and market drivers which would help the stakeholders to decide and align their market strategies according to the current and future market dynamics. 13.2	IBM India Pvt. Ltd.
13.3	Dell India Pvt. Ltd.
13.4	Lenovo India Pvt. Ltd.
13.5	Cisco Systems (India) Pvt. Ltd.
13.6	Microsoft Corporation (India) Pvt. Ltd.
13.7	Amazon Web Services Inc.
13.8	Fujitsu India Private Ltd.
13.9	Oracle India Pvt. Ltd.